The benefits of live posting. What are the benefits of live posting? 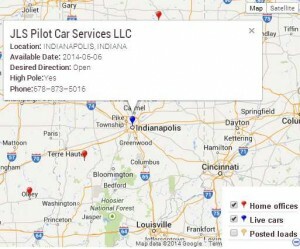 While having a home base pin on the PiloTrac map is essential as more oversize trucking companies begin to use the system on a regular basis there are other tools too. Live posting is a tool you don’t ever want to overlook. Why? It’s simple. If visitors can see where you are going to be locate in the future they can plan for the future as well. Clearly JLS is going to be in Indianapolis on the 6th. Consider this. Let’s say you just booked one of your pilot cars to Orlando, FL from Dallas, TX. You know that the load will finalize in Orlando on the 18th. But today is the 10th. If you were to post that same vehicle as being available on the 18th or the 19th then visitors can see your posting in advance. This opens up a whole new opportunity for your company. You can now potentially book that same cars next run before it has completed the one it is currently on. This capability brings a new level of efficiency to the industry. Many of the millions of miles that are wasted by pilot cars dead-heading home every year can potentially be eliminated. We’re not claiming that we’ve going to completely eliminate dead-head miles but this new capability certainly should not be overlooked by any means as the potential of it offers amazing possibilities to every individual operating within the industry. Less miles wasted on dead heading back home. 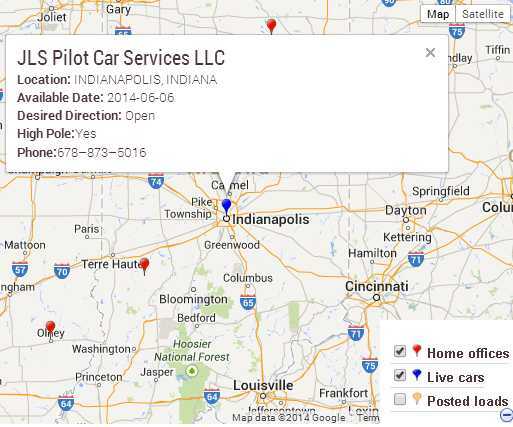 So in case illustrated above visitors can see that JLS Pilot Car Services is clearly going to have a vehicle available for hire in Indianapolis, IN on the 6th. Carriers know to click on their desired date for service by using the calendar just below the map on the right hand side to search for future dates. Live posting maximizes your potential of getting re-hired and minimizes your potential of driving hundreds or even thousands of miles without getting paid for it. Live posting, use it! Pilot Cars Admin, Feb 17, 2016 - The benefits of live posting. We’re much more of a long term solution with direct customers rather than a broker stuffed load board. While brokers are needed at times we prefer to connect our customers direct. We can see from our traffic that the majority of our users do what we call “click and call” rather than post as it’s easier for them. You have to ask yourself what kind of company has multiple pilot car runs? The answer is either a carrier with a contract or a brokerage company. Pilot Cars Admin, Mar 06, 2015 - The benefits of live posting. As you probably know PiloTrac is a upgraded system which was a simple directory before. We built in the “load posting” feature for many reasons but primarily because we knew our users as well as us would think “wouldn’t it be neat if…”. What we’ve found in this past year is the trucks prefer to “click and call” as its so much easier. Select the company that is the closest and in an instant you’re speaking with them. However we have had a few hundred loads posted. We’ve also learned that primarily there’s two general company types that have multiple pilot car runs; one being pilot car brokerage companies and trucking companies that have multiple runs due to a contract with the later option being preferred. While we’re not against pilot car brokerage it is PiloTrac’s prime objective to connect pilot car companies with trucking companies direct. Pilot car companies that use the PiloTrac system and spend time creating good detailed listings are doing just that as the “Pilot Cars” link has been displayed on every page of WideloadShipping.com and carriers are on the website already dealing with customers so it’s not probable that they open a new search window to start a completely new task when the link has been there for over 10 years. As mentioned elsewhere on the site if you’re selling peaches it might be wise to advertise where the peach buyers are located rather than say a transmission builders publication. We’re excited about our live posting function as well since it can let oversize carriers know where you will have available equipment in the future. With this tool you can potentially book your next run before completing the one you’re currently on by posting your future location(s) as soon as you learn where they will be. I hope this information has helped you in your difficult decision of choosing how to use your companies resources in order to get the most return on your investment. Jeanne, Dec 13, 2014 - The benefits of live posting. we are a new company thats excited to be of service. We’re trying to find the load boards so we can get started.. Ive logged in on the site but need help navigating to find the load contact info.. any ideas.. thanks.. 1st Class Pilot Car..